Two link cable connectors provide the output signal route to the strings of EK modules – each cable addressing two strings. A three-metre power cable is hard-wired to the box. Riggers simply decide which string of modules to connect to which circuit. Operators select the string to be armed with the rotary switch and hit the Fire button to drop. Then they move on to the next one. Couldn’t be easier! You could achieve the same effect by running two Basic Firing Boxes in parallel. 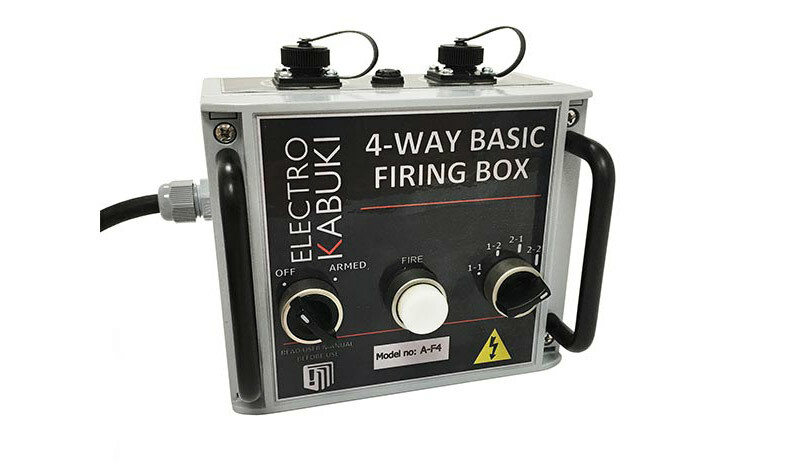 But the 4-way box gives you the convenience of a single firing button – so there’s absolutely no room for confusion over which fire button to hit next. And it’s priced at around 25% less than the cost of a pair of Basic Firing Boxes. Even though it’s not something that’s likely to be needed if you specifically choose the new 4-way system, bear in mind the one restriction: you cannot link the strings of modules together and drop them all with a single press. You can do this for the two circuits connected to a Basic Firing Box, and of course on the DMX/Sensing Firing Box. So why the ‘ladyboy’ headline? There were two initial enquiries that led us to recognise a need and develop the 4-way box. The first was from a staging company wanting to release four consecutive balloon net drops for a New Year’s Eve party in Macau. But by far the more intriguing request, received a few weeks later, was from one of our EK Distributors, AC Entertainment, for a project based in Thailand. We’re told that this is for a Ladyboy Show, where the goal is to expose each individual artiste one at a time. In this context, perhaps the word ‘expose’ is not the most sensitive. Then again, this curious use of Electro Kabuki does give an imaginative new meaning to the term ‘theatrical reveal’.